Of the three main revenue streams, the contribution from ship repair operations is showing an increase of 9.5 per cent on the same period in 2014, which is partially compensating for a downturn in the second revenue stream, the rig repair sector, Asry said in a statement. Revenue from the third stream, the New Construction & Engineering division, is also up year-on-year. “Operationally, the yard is maintaining high capacity, with high berth and dock occupancy, but restrictions lingering in the global maritime repair sector are keeping repair scopes on the lower side. Naval repairs have been strong in the period, with commendations received from several naval clients. The remainder of the year looks optimistic with continuation of good ship repair activity and successful bids on several rig repair projects,” the company said. The figures were released at a meeting presided over by Shaikh Daij bin Salman Al-Khalifa, chairman of the board and representative of Bahrain. The meeting was attended by seven shareholding companies, the others being the UAE, Saudi Arabia, Kuwait, Qatar, Iraq and Libya. The board said in a statement that decisions were taken on important issues to support the firm’s future growth. 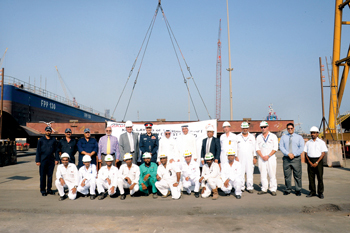 The commencement of the landing craft erection was attended by Shaikh Daij, alternate Asry board director Hassan Ali Al Majid, the company’s chief executive Nils Kristian Berge and Bahrain Coast Guard’s Brigadier Ala Abdulla Seyadi. “As we lay this keel, we are seeing progress on the project continuing on schedule, with over 50 per cent of steel cutting already completed, and steel panel assembly well underway,” confirmed Asry’s new construction and engineering senior manager, Sauvir Sarkar, who is overseeing the project. Proceedings also included a tour of the steel production facility and a presentation in which a full progress report was presented to Brigadier Seyadi and his team. In the presentation, the interactive communication between Asry and the BCG was highlighted, as several improvements to the project have already been made as a result of the regular cooperative meetings between the two parties development teams. Lt Col Jahangir Sarwar, BCG’s project manager, also praised the benefits of these fruitful interactions, Asry said. The landing craft, to be delivered to Bahrain Coast Guard in the first half of 2016, marks Asry’s first newbuild contract since launching the New Construction & Engineering division, which is tasked with growing the new construction programme at the yard. It will be approximately 34.5 m in overall length, with two 500 kilowatt engines, having a top speed of 10 knots and cargo deck capacity of 40 tonnes. Asry already has experience in the new construction sector having built offshore support vessels, ASD tugs and power barges. Asry is the Arabian Gulf’s most experienced ship and rig repair yard. Founded in 1977 in Bahrain, it has experience in marine asset optimisation. Its leading range of facilities includes a 500,000 dwt drydock, two floating docks of 252 m and 227 m in length, 15 repair berths with a total length of approximately 4,000 m, twin 255m slipways, as well as a full range of workshops and service centres. The yard’s portfolio of capabilities is not only the largest in the Arabian Gulf, but also includes jack-up rigs and other offshore assets, due to a dedicated division – Asry Offshore Services. Combined with a series of other diversifications including a New Construction & Engineering Division for marine engineering packages and newbuilding services, Asry is a multi-functional marine services hub committed to providing international standards to global shipowners operating in the Arabian Gulf.